Before you make a final decision on who’ll help plan your wedding, an in-person or over-the-phone interview is a must. Prepare yourself with this list of important questions to help you find out which wedding planner is the right fit. Here are the key questions (and what you should listen for in their answers) when you’re hiring a wedding planner. Why you want to know: This should be your first question—you don’t want to waste time if they’re not free. If your dates are still flexible and you’d be willing to wait in order to work with someone you really love, ask for a few options so you can take them into consideration when you’re finalizing the wedding date. What’s the cost of the average wedding you plan? Why you want to know: Check their range of prices and if they have a minimum wedding budget they’ll work with. This is a good way to gauge whether they’re within your price range or, if you haven’t set a budget yet, it can give you an idea of what your budget would be. Wedding planning services should be about 15 percent of your overall budget, so if their baseline is way above the budget you’re aiming for, you may want to consider someone else. If you really love them though, don’t let this discourage you—you can always ask if they’d be willing to just do part time or blueprint planning for a smaller fee instead. What sorts of services do you offer (day-of coordination, full-service event design or à la carte planning)? Do you create the overall vision, or are you more of a producer who brings in an event designer? Do you handle event styling? 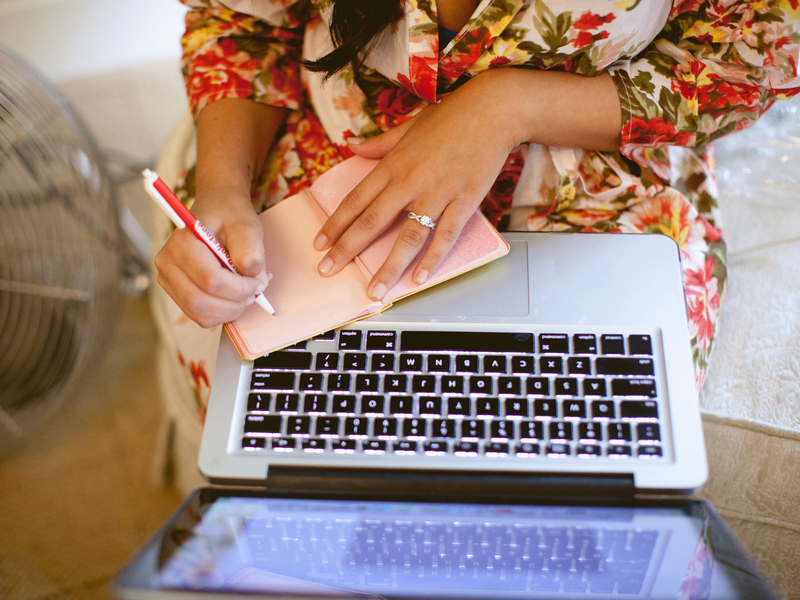 Why you want to know: It’s not always clear from their website or initial interview what exactly their services are, so it’s good to ask for an explanation of the types of ways they can help you with your wedding planning. This info will make it easier to decide what type of planner would be best for you. For example, if you’re super-organized and have time to follow up with pros yourself, then you may want someone for a coordination role. If you do both design and coordination, what is your main specialty? Why you want to know: Find out their strong point, if they have one. If you need one more than the other, then you’ll want someone who specializes in just that, but if you need both coordination and design help, you should find someone who has an equal balance. Why you want to know: Wedding specific experience is a must, so ideally you’d want someone who’s planned at least a few, but preferably a lot of them. It’s great if they’ve also planned parties and corporate events, but it’s not the same—weddings have an emotional and personal element that other parties don’t. If they’ve worked as an assistant under another planner, ask which weddings they specifically worked on and what their role was. How many weddings will you be working on at the same time (day of and throughout the entire process)? Why you want to know: On the day of your wedding, you want their full attention, so make sure they’re not juggling multiple weddings at once. But it’s okay, and realistic, that during the process, your planner will be working with other couples at the same time. How many they can handle really depends on the size of their team and whether the weddings are being planned locally or afar, so take note of details like that too. Do you handle professional services, contracts and payment processing? Why you want to know: The answer to this question should help you get a sense of how other pros will be handled throughout the planning process. It’s a good idea to figure out how they prefer to work ahead of time—some planners will request a lump sum and from there handle hiring and paying pros for you. Others will ask you to cut the checks for other pros yourselves. It’s generally best to pay your vendors directly instead of through your planner. This way, you’ll have more control over the contract and your budget, so you’ll want to find out whether this is an option. Are there specific pros you like to work with? What’s your process for selecting and hiring them? How would we be involved in the selection process? Do any of them offer client discounts? Why you want to know: It’s great if your planner can help you snag a discount you may not have gotten if you’d hired pros on your own, but you also want to make sure they’re really sending only the best people for the job your way. During the meeting, jot down some names of professionals they prefer to work with ahead of time, so you can do your own research too. Do you do destination weddings (if applicable)? Why you want to know: Ask if they’ll not only travel to plan your wedding (because most will for a fee), but that they’ve planned an entire wedding weekend from afar, which requires an extra layer of coordination. It’s great if they have experience with things like coordinating travel, planning a welcome party and farewell brunch, and putting together welcome bags. Do you handle rentals? Will you coordinate delivery, arrival and set up times with the photographer, the florist, the musicians and the caterer/banquet manager? Why you want to know: Again, you want to find out exactly what’s included to make sure you’re on the same page about what they will and will not take care of. If their role is more to consult with you on ideas and help you find and book your pros, then you may need to find a separate coordinator to help you take care of these day-of details. What was the most unique wedding you ever planned? Why you want to know: Specific details and, even better, photos of the standout weddings they’ve planned can help you get a sense of their style. Take note of what you do and don’t like and whether they’ve come up with ideas that feel new and creative, or if they’re reproducing what’s already out there. This is their chance to show off how creative they can really be. What are some ideas you have for pulling off our vision? Why you want to know: It’s okay if they don’t cover every detail of what you want—you’ll work together later on to hash out the specifics. But if all of their ideas are way off —like if you say you’ve always imagined a rustic wedding under the stars and they only suggest ballroom venues—that’s a red flag. It could mean they’re not really listening to what you want or you may just have differing opinions. And if that’s the case, they may not be the right fit for your wedding. What’s your secret for staying calm under pressure, and how do you deal with day-of disasters? What’s the biggest wedding mishap you’ve ever encountered and how did you deal with it? Why you want to know: Things like a foolproof backup plan, how they stay organized to prevent problems in the first place, and the steps they take to fix unexpected issues all demonstrate whether or not they’re a problem solver who will be able to take care of just about any situation. How many meetings will we have? Do you come with us to all of our relevant meetings? How often will we communicate, by phone and by email? What’s the best way to get in touch with you? Why you want to know: This is when you should get an outline of what the wedding planning process would look like if you work with them. Some will email sketches and follow up over the phone, while others may create online inspiration boards but prefer to verbally walk you through swatches and sample designs in person. Some will ask you about each and every detail while others wait and fill you in on everything all at once. Asking them how they prefer to communicate will help you get a sense of their working style too. How many people on your staff will be at the wedding? Why you want to know: Find out how many assistants, coordinators and event stylists your planner will also bring on the day of, so you can be sure everything’s handled and you can relax and enjoy the day. The final size of the day-of team depends on your wedding’s specific logistics, but they should tell you the number of staff members needed for the typical wedding they work on. Can you create a timeline that tells everyone involved in the planning process—other pros, members of the wedding party, to-be-weds and families—what to do and when to do it? How will you make sure everyone sticks to the schedule? A wedding planner’s role isn’t just to manage the pros, but your A-team of friends and family too, which isn’t as easy as you might think. They should tell you what their system is to make sure everything runs smoothly and on time, and listen to cues that show they could easily handle your family and friends in a firm, yet respectful and friendly, way. What happens if you’re sick or otherwise unable to be there on the day of our wedding? Why you want to know: Back-up plans aren’t just for outdoor weddings. You want to make sure they have someone capable on hand to take over if they get sick or can’t make it that day, like another planner at their company or a seasoned assistant. They should also have a plan in place for what’ll happen if they have to hand over your wedding to someone else in case of an emergency. Why you want to know: Get the names and contact info for any recent couples and pros they’ve worked with, so you can do your own digging on anything you’re unsure about. They should provide these willingly and encourage you to reach out to them—that’s a sign they have lots of happy clients and colleagues. How will you help me stay within my budget? Why you want to know: Even without knowing your budget, a great planner should have suggestions on things like venues that are budget friendly, creative ways to save, and alternatives to more expensive options to help you stay on track throughout the process. How do payments work (a percentage of our budget, a flat fee)? Will there be additional expenses on top of your base fee (travel, parking, food)? Why you want to know: Exactly what is and isn’t included in the fee they’ve quoted you and how they calculate it, so you can budget for any extra items. You may also be able to negotiate these types of fees and the payment schedule before you sign the contract. Have you planned any other weddings on Palmfront? Why you want to know: If they’ve planned a wedding on Palmfront, it’s a major bonus—they’re likely familiar with the logistics and planning which can help things go more smoothly. They may also have specific suggestions or design ideas they’ve learned from working with couples on Palmfront.